And you thought that the Candy Holidays were over until Halloween…well, there are many more candy-dedicated days to come…stay tuned, or bookmarked….here’s a site where you can track those days yourself and mark your calendar accordingly. Note that my birth month of June is national candy month! Plus, I have decided to make up my own holidays which will come up as needed. Today is Salt Water Taffy Day. 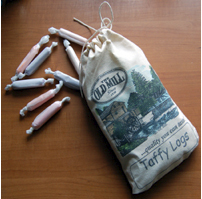 The Old Mill in Pigeon Forge, Tennessee sells the best taffy anywhere. Go ahead and order the 2 pound box, trust me. Posted in chewy candy, Holiday candy. Bookmark the permalink.